Thank you! Check your email for a confirmation link. Add lifemades[email protected] to your email contacts so that you don't miss it. Once you confirm, you'll receive a link to download the printable! 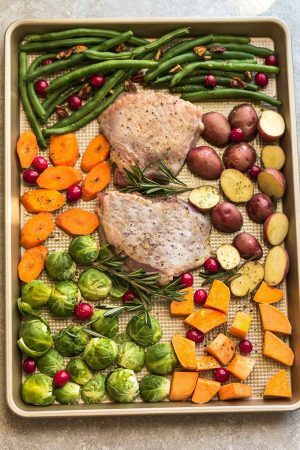 Sheet Pan Turkey Dinner For Two – an easy and healthy one pan Thanksgiving meal for two (or four). Best of all, everything cooks up in under an hour. Includes a juicy turkey, potatoes, green beans, carrots, sweet potatoes, broccoli and cranberries. Can you believe Thanksgiving is this week already? Many of those with families out of town will be traveling this week…but what if you’re a newlywed couple far from home (that was totally us some years), an empty-Nester or hosting a small get-together? 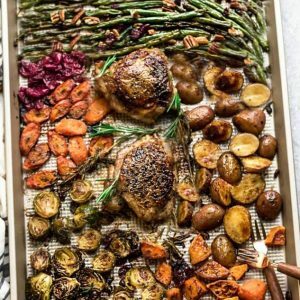 If that’s the case, this all-in-one recipe for a Sheet Pan Turkey Dinner is the perfect meal to feed two people, with leftovers, or you can increase the amount for as many as four people. 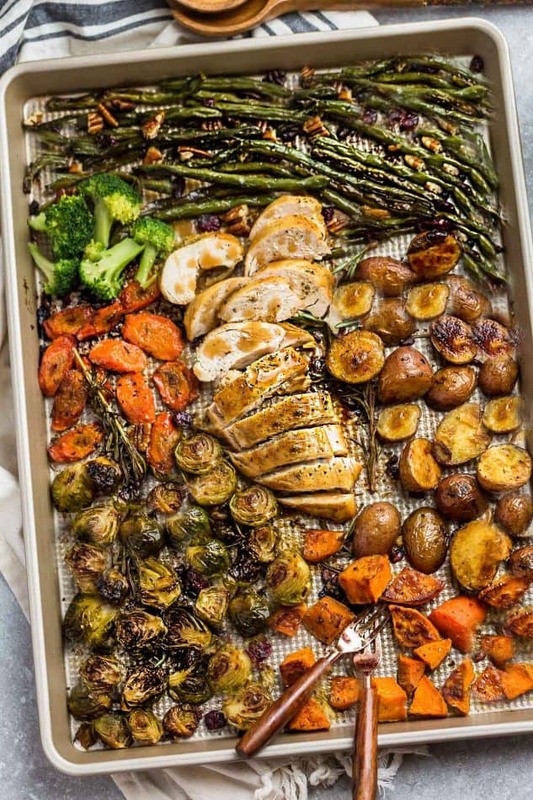 What’s great about this sheet pan turkey dinner recipe is that you can customize it with your favorite parts about Thanksgiving dinner. If you’re not a fan of Brussels sprouts or carrots – feel free to swap them out with cauliflower, butternut squash, broccoli or whatever you have on hand. 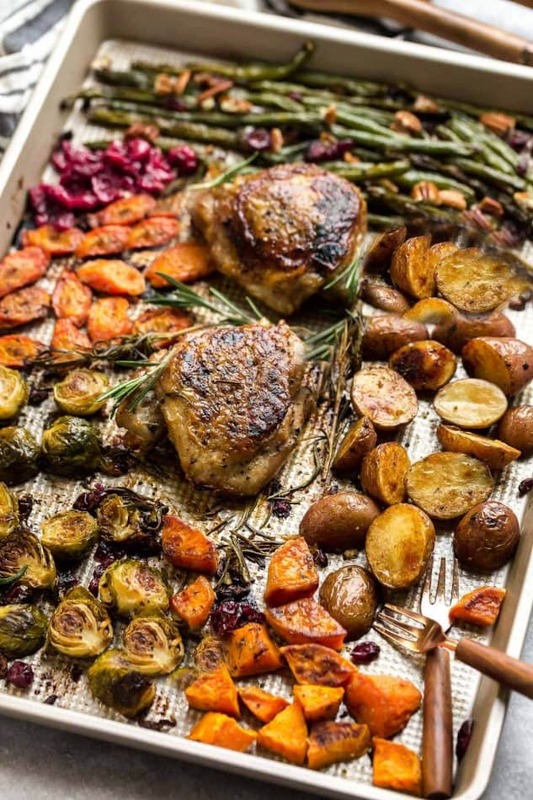 The best part about this one pan turkey dinner is that everything is cooked on one tray in under an hour. You can choose to use turkey breast, turkey thighs or even turkey drumsticks. All that’s left to do is choose the sides you want to make. And feel free to serve with your favorite stuffing or cranberry sauce as well. Preheat oven to 400F. Season turkey with salt, lemon pepper, one teaspoon of Italian seasoning and one tablespoon olive oil. Place on a large rimmed baking sheet and roast for 15 minutes. Meanwhile, prepare the other ingredients as needed (peel, wash, dry, chop vegetables etc.). Combine all the vegetables in a large bowl and drizzle with the remaining two tablespoons of olive oil, season with salt, lemon pepper and remaining one teaspoon of Italian seasoning. 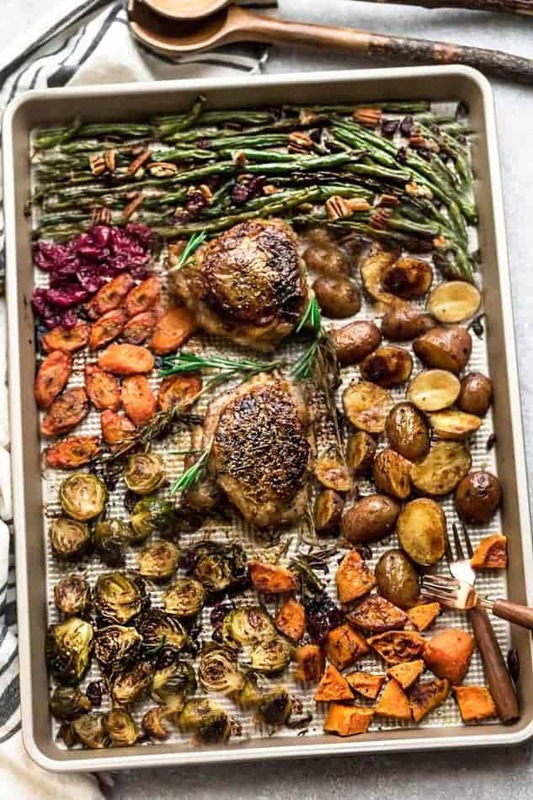 Remove sheet pan from the oven and arrange the sweet potatoes, baby potatoes, and Brussels sprouts evenly on the sheet pan, surrounding the turkey. Add a few sprigs of fresh rosemary around the pan. Return pan to oven and continue to roast. After 20 minutes, remove the pan from the oven and flip the turkey and the vegetables. Add the carrots, green beans, fresh cranberries, pecans, and dried cranberries to the pan arranging evenly around the turkey. Return pan to the oven again and roast for another 15 minutes – or until turkey is fully cooked and reaches 165F internal temperature and vegetables are soft and tender. Remove pan from oven. Cover loosely with foil and rest for 10 minutes. Carve and serve. What’s great about this one pan turkey meal is that you’re not stuck with a ton of dishes to wash. You can also make this for any other night you’re craving a festive dinner without having to make a giant turkey. Plus, it’s also gluten free, dairy free and fits into a paleo friendly or Whole 30 compliant way of eating. 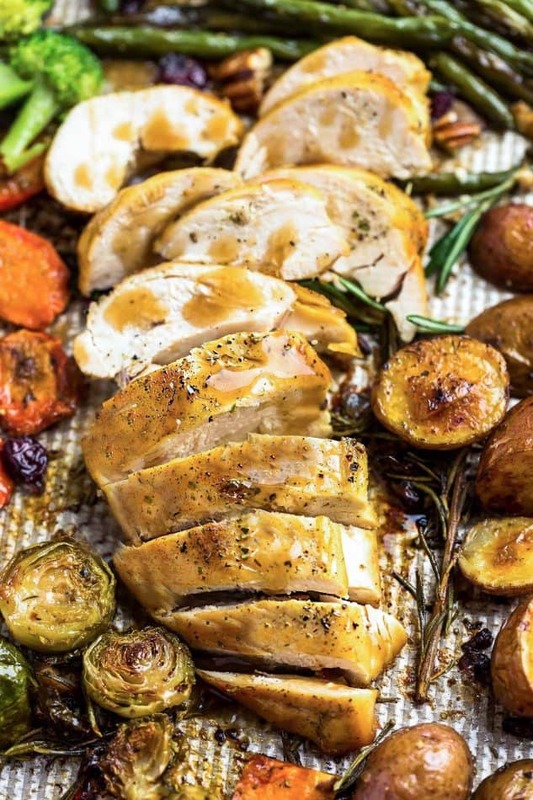 This sheet pan turkey dinner is quick, easy, and I love that it’s a lot less fuss than making a whole turkey or if you don’t have a large Thanksgiving or Christmas dinner planned. Turkey breast and thighs cook in the oven in under an hour so that makes this meal great for busy weeknights as well. This turkey dinner recipe DOES require a little bit of planning in order for all the components to finish cooking evenly and at the same time. If your turkey breast is larger than two pounds, you may have to adjust the cooking time accordingly. Be sure to chop the vegetables to around roughly the same size so that everything will finish cooking at the same time. And of course, feel free to wash and prep the vegetables in advance. That way, when dinner rolls around, all you have to do is pop everything onto the sheet tray and throw it into the oven. 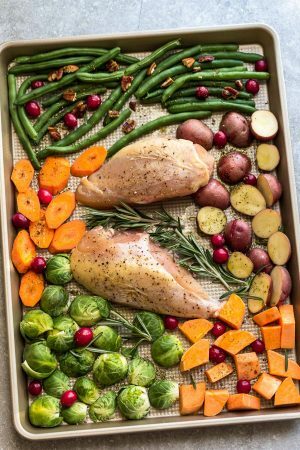 Sheet Pan Turkey Dinner For Two - an easy and healthy one-pan Thanksgiving meal for two (or four). Best of all, everything cooks up in under an hour. Includes a juicy turkey, potatoes, green beans, carrots, sweet potatoes, broccoli, and cranberries. Season turkey with salt, lemon pepper, one teaspoon of Italian seasoning and one tablespoon olive oil. Place turkey on a large rimmed baking sheet (mine was 10x15) and roast for 15 minutes. Meanwhile, prepare the other ingredients as needed(peel, wash, dry, chop vegetables etc.). Return pan to oven and continue to roast. After 20 minutes, remove the pan from the oven and flip the turkey and the vegetables. Add the carrots, green beans, fresh cranberries, pecans, and dried cranberries to the pan arranging evenly around the turkey. Return pan to the oven again and roast for another 15 minutes - or until turkey is fully cooked and reaches 165F internal temperature and vegetables are soft and tender. **Cooking time varies according to the size of your turkey. If your turkey is more than two pounds, you may want to leave it in longer before adding the carrots and green beans. If your turkey is smaller, just remove from the oven sooner once.